The attack on waterfowl hunting in Canada is in full-swing. Regular readers of this column are aware that the future of hunting faces numerous challenges in Canada, and it is foremost on the minds of Canadian waterfowlers. Most hunters are perilously unaware of how close they have come in recent times to losing their shotguns, or to having their hunting grounds declared off limits. Others have experienced the sad and angry flow of emotion when they no longer have access to places they have hunted all their lives. To never see another sunrise with gun in hand, or the flight at day-break on a familiar duck marsh, is the price of ignoring threats to the future of waterfowling. The battle for waterfowling in Canada is coming to the US, it is just a matter of time. On the Canadian front, efforts to undermine hunting, fishing, trapping and shooting sports take various forms. The direct threat is when well-known anti-hunting or animal rights organizations speak out against the outdoor activities listed above. These attacks are usually commentary in newspapers, or letters to editors produced by networks of advocates posing as individual commentators. This threat is the easiest to recognize and deal with. Another animal-rights tactic is to work quietly with government at all levels, to influence legislation that they can use to launch a legal challenge to hunting. An example is the pending federal animal cruelty act, which has been through numerous iterations, as the animal-rights groups struggle against traditional animal users. A firearm is the most fundamental tool of the hunter. Anti-gun, anti-hunting activists know that without firearms and ammunition, hunting will be over for most of us. All hunters need to oppose efforts to disarm hunters, through government policy and law, as this is the greatest single threat to hunting in our time. The anti-gun crowd tends to lump hunters in with criminal users of guns on the streets of major cities like Toronto. Responding to frequent gun violence, the mantra is consistent--guns are dangerous and bad, removing guns is good--little distinction is made between gun use by gangs and hunters' firearms. As long as gun violence occurs, political opportunists will call for banning or further restricting firearms, including those used by hunters. Hunting advocates must remain vigilant of the anti-firearms crusade, and prepared to intervene directly in the public debates on firearms. The anti-gun lobby also works quietly with supporters in positions of influence, where they can find them in governments in Canada, and through the UN, governments and organizations abroad. The UN protocol on firearms marking was scheduled for implementation in Canada. Hunting groups and the firearms industry were quick to realize the marking protocol could reduce or eliminate most hunting firearms brought for retail sales into the country. Fortunately the hunting and shooting sports advocacy groups working with industry, managed to achieve a three-year delay in the implementation of the protocol. In other areas the threat against hunting is based on a perception of social change. Hunting is not attacked directly, but indirectly as an evolved feature of a society with a new social ethic in regard to the use of animals. Those espousing this mantra often make the vacuous assertion that as Canadians, "we have moved beyond" hunting, fishing and trapping as lifestyles or forms of entertainment. They acknowledge the role of such outdoor activities in the founding of the nation, but maintain that hunting, fishing and trapping are no longer necessary nor desirable. This vague notion is played out when governments quietly back away from delivering their wildlife management mandates, particularly in the area of sustainable use of natural resources. It is also played out in the decisions of many foundations and corporations not to fund conservation projects undertaken by the "hook and bullet" crowd. Countering these threats and trends, is a number of outspoken wildlife groups supported by hunters, anglers, trappers and shooting sports enthusiasts. These groups work closely with the firearms industry group and others to keep governments on track with wildlife management programs, which benefit hunters and other resource users. The following is a brief update on a couple of key issues these groups are addressing. Who would have imagined Delta Waterfowl, along with key provincial groups like the Ontario Federation of Anglers and Hunters (OFAH) would be the leaders in the conservation community in defending the CWS and its programs? In the past, Delta was seen by some folks as a bit of a renegade in questioning some of the conservation programs undertaken by CWS and its partners, but when the CWS Migratory Bird Program and the National Wildlife Area network came under threat of severe budget reductions, it was Delta Waterfowl that stepped into the public arena to ardently defend the CWS, and its programs. In September '07, Delta appeared on the CBC National News to question the pending cuts. The Canadian Wildlife Federation also spoke up on behalf of CWS and wildlife. The CWS story on the proposed cuts was broadcast on CBC radio across the country over the next week. Newspapers joined in, with local and provincial hunting groups, like the New Brunswick Wildlife Federation and some regional naturalist's groups turning to the media in support of CWS. This incident underlines the importance and value of advocacy groups like provincial wildlife federations, Delta Waterfowl and other hunting, fishing, trapping and shooting sports organizations to hunters. Because these groups receive little federal funding, they are free to speak out on issues where government actions and the interests of outdoor heritage users may be at odds. In times of growing concern over the future of hunting, it is critical to have groups that can respond in public to government actions where these may not be in the best interests of hunters. John Baird, Minister of Environment Canada, issued a press release shortly thereafter saying that the pending cuts to CWS were "dead on arrival" when they reached his desk. At this point, senior Environment Canada officials are conducting a review of the CWS Migratory Bird Program among others. Discussions are ongoing with Minister Baird's office in the hope that programs of vital importance to waterfowl hunters and migratory bird management are maintained. The good news is that provincial wildlife federations, Delta and other advocacy groups are watching CWS closely to ensure the right decisions are made for wildlife, and all Canadians with an interest in conservation. nter dollars will continue to flow to wetland habitat conservation projects through the impartial control of WHC. 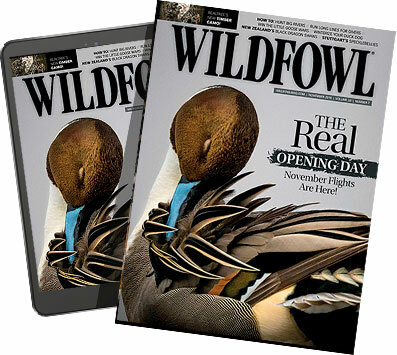 The successful conclusion of this issue for waterfowl hunters was derived from hunting groups acting individually and collectively to send a strong message to government, that they wanted WHC to continue to receive and disperse duck stamp revenues to conservation projects. It also resulted from a Minister who listened to the many voices of the hunting constituency and realized that where there is consensus among the grassroots, therein lies political strength. I recently visited Saskatchewan at the invitation of Darrell Crabbe, executive director of the Saskatchewan Wildlife Federation (SWF), to give the keynote address at the SWF annual convention. For a duck hunter, it is almost reverential to visit Saskatchewan, even in the off-season. The province is as famous for its people as its duck hunting. It is the only place where you can ask a farmer to hunt on his land, and end up staying for five days. The SWF theme was about the federation's role as the voice for the future of wildlife. It was an opportunity to bring messages about the threats facing hunting nationally, and the fact that hunting in Saskatchewan could be terminated by events occurring beyond the borders of province. Addressing those threats will require the strong voice SWF is continually building for hunters within Saskatchewan, but also with like-minded people and outdoor interests across the country. On a per capita population basis, SWF is the largest wildlife conservation organization in the world. This is a great footing for wildlife to build on, and good news for our Canadian hunting heritage.